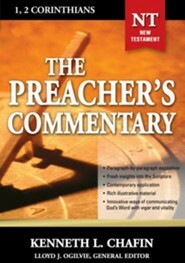 Kenneth L. Chafin offers a stirring and moving exposition brimming over with insight and wisdom. Join him and experience the adventure of speaking to the problems and potentials of Christians today as you preach and teach through 1 and 2 Corinthians. 304 Pages. Softcover from Thomas Nelson. 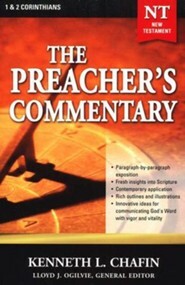 The Preachers Commentary Series combines rich resources of historical setting and textual interpretation with spiritual insights and contemporary illustrations specifically designed for communicators. Based on the New King James Bible. The late Kenneth L. Chafin died in 2001 after a distinguishedcareercommitted to evangelism and ministry. He taught at two Southern Baptist seminaries, including serving as the first Billy Graham Professor of Evangelism at Southern Baptist Theological Seminary in Louisville, Kentucky. General editor Lloyd J. Ogilvie brings together a team of skilled and exceptional communicators to blend sound scholarship with life-related illustrations. I'm the author/artist and I want to review 1,2 Corinthians - eBook.